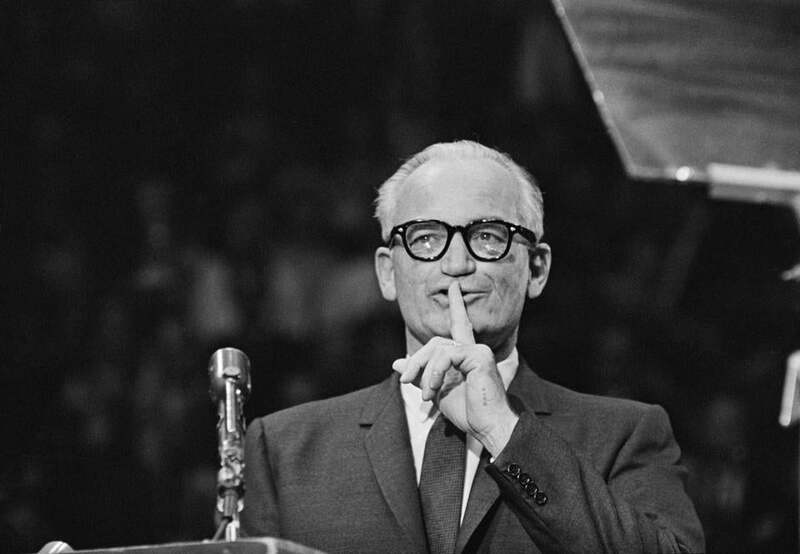 United States Senator and nominee for president Barry Goldwater (1909 - 1998) speaking at an election rally in Madison Square Garden, New York City, Oct. 28, 1964. Last month, the American Psychiatric Association reasserted its broad interpretation of the Goldwater rule, which states that psychiatrists should not diagnose public figures from a distance. We consider this act to be politically influenced in dangerous ways. It happened not because it was scientifically called for or because a group of psychiatrists were breaking established guidelines. It happened because psychiatrists were bringing to light a politically inconvenient truth. The group of mental health professionals (which includes us) was not breaking the Goldwater rule as it was written and as the APA had interpreted it prior to Donald Trump’s election. We were merely fulfilling our obligation to the public by calling attention to a dangerous situation that happened to involve the political sphere. This followed an unprecedented expansion of the Goldwater rule last March to include not just diagnosing but making any comment on any observable aspect of a public figure’s expressed emotion, speech or behavior, even in an emergency. The expansion ran so afoul of the ethical principle the rule fell under (that we contribute to public health) and the very principles of medical ethics (that human health and safety come first), that members resigned in droves, and the APA has been flooded with protest letters for modifying a rule without consulting its membership. Yet, rather than respond to its members’ demand for a vote, the association doubled down on its new interpretation of the Goldwater rule. This occurred amid continuing concern from many observers about the president’s mental stability, competence, and ability to refrain from creating dangerous situations. Our book, “The Dangerous Case of Donald Trump” cites objective evidence-based reasons for our heightened concern about the dangers of Trump’s proximity to weapons of mass destruction. We call out the need to assess the risk posed by this president (and future presidents) who carry such awesome power. We base our recommendation on well-established and widely accepted standards for dealing with individuals who constitute a danger to others. These logically may include temporary removal from access to weapons pending a thorough, prompt, and fair evaluation. It is especially important to abide by professional norms and standards during politically charged times. It is especially dangerous to convert a reasonable rule into a gag rule, defying even the most foundational principles of medical ethics. We call on the APA, which receives federal funding, to suspend its new interpretation of the Goldwater rule pending a scientific reassessment, by drawing on current scholarship across mental health disciplines and by encouraging debate, rather than by following political expediency. The APA’s recent clarification called “for an end to psychiatrists providing professional opinions in the media about public figures whom they have not examined.” By conflating the call for an urgent evaluation based on dangerousness with diagnosis, and prohibiting that “diagnosis,” the APA has attempted to silence mental health professionals’ ability to share their concerns about a public figure, even when it is about the public’s health and safety. It should be obvious that acting to address a societal danger, a public health concern, to which our ethical guidelines obligate us, is different from diagnosing, which is an intricate act that traditionally relies on a personal interview. Not only is there scant scientific justification for the APA’s expansion of the Goldwater rule, it also runs counter to the trends of research that call for less reliance on in-person individual interviews. Instead, a greater potential exists for psychiatry to contribute to public discourse alongside sociology, anthropology, political science, social work, and journalism, to aid in prevention as well as to serve population health nationally and globally. Indeed, this was the stance of the APA when it was in the process of gradually reducing the importance and expanse of the Goldwater rule, in its own interpretations of the rule just prior to the current administration. Fundamentally, mental health professionals have a public health obligation that constitutes a duty to educate the public when they discern a dangerous pattern of behavior in an official who is in a position to do them great harm.